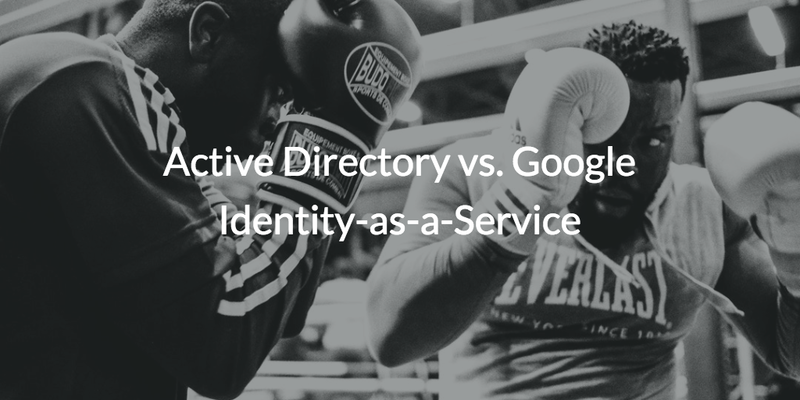 The fight is on: Microsoft Active Directory® (AD) vs Google Identity-as-a-Service (IDaaS). From startups to established organizations, IT admins have been holding their breath as they wait to see who will win the fight over who offers the best control over an organization’s identities. Identities, after all, are the gateway to any number of services and the control point for an organization. It is critical that organizations have the best of what is out there for directory services for a number of reasons including security, efficiency, and visibility. Let’s take a brief look at what Active Directory and Google Identity Management Services have to offer. Microsoft has had their hat in this ring for quite some time with Active Directory and has been a dominating force within the directory services market. They leveraged their position with Windows, Exchange, and Office to create a monopoly in the directory services space which subsequently reinforced their position in the enterprise IT space. Suffice to say, Microsoft has been a strong opponent in this fight for control over identities. However, the last decade has witnessed the emergence of web-based apps, the cloud, and Mac and Linux systems loosening Windows’ grip on the workplace. Slow to adapt, these changes have deflected just the right blows, and have kept Microsoft from claiming total victory. Google, known for being the fast moving cloud disruptor, has fully embraced the cloud (think Google Cloud Platform) and web-based apps with their own SaaS service – G Suite (formerly known as Google Apps). Google has been making huge inroads with G Suite, and currently has over 5 million business customers. Their success forced Microsoft into creating O365 and Azure. While Microsoft focused on replacing Exchange and Office, they left Active Directory untouched. 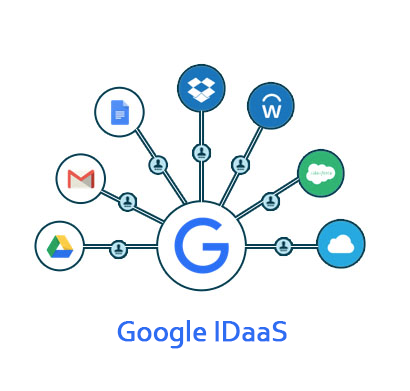 Is Google IDaaS Google’s attempt to throw a hat in the ring in the fight for directory services? No, they are creating a user management system for Google services and becoming an authentication source for a few, select web applications. They aren’t focused on being a replacement to AD, but rather a complement. Sadly, this match between AD and Google Cloud Identity is over before it even started. While AD and Google IDaaS may be on good terms, IT admins are still in a bind. Many G Suite and Google Cloud Platform customers still maintain on-prem AD, but they want to move to the cloud. The good news is that you can replace AD, while shifting to the cloud completely. 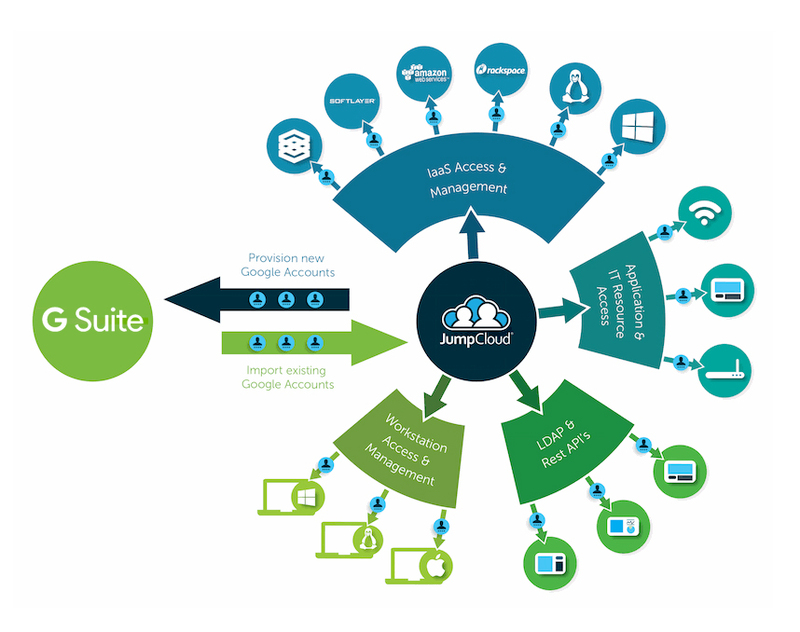 The cloud identity management platform, Directory-as-a-Service® (DaaS), tightly integrates with G Suite and Office 365 while connecting users to the IT resources they need including systems, applications, storage, and networks. Check out this eBook on how you can extend G Suite or Office 365 identities to your directory services. You can also learn more about replacing Active Directory by reaching out to us or testing our virtual identity provider out for yourself by signing up for a free account. Your first ten users are free forever.